Roller chain links are available in a range of sizes in both British standard and American standard. Use the product filters on the left to select your required roller chain pitch or ISO reference. Looking for Sprockets? 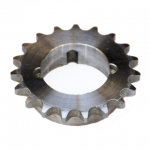 Click Here for our range of Roller Chain Sprockets.